About Pinconning Cheese Company- We’re 70 years old this year! Pinconning is designated "The Cheese Capital of Michigan" because it is the home of the famous Pinconning brand of cheese. The Pinconning formula was created by Dan Horn who settled here in 1915. Currently, Pinconning Cheese is produced, along with other styles of cheese at several plants around the state. They produce our famous style of cheese under our special formula supervision. Because of its formula, Pinconning cheese is ageable, which differentiates it from Wisconsin Colby. The aging process is what gives Pinconning cheese its special and unique flavor. Here at The Pinconning Cheese Co., the cheese is aged up to 120 months. Super sharp cheese is an original and can only be found at Pinconning Cheese Co., Deli and Fudge Shoppe. Nowhere else in Michigan can Pinconning cheese be found in the super sharp range. 2018 marks the 70th year of continuous business operation of the Pinconning Cheese Company. From the establishment of its beginning in 1948 by then owners Harry and Marie (Horn) Bennett and they established Bennett Cheese Store by converting an existing building built in 1946, and constructed an addition, at the Pinconning Cheese Company’s current location, on the stretch of US-23 that was the main road for downstate travelers to go north. Marie (Horn) Bennett was the daughter of Dan Horn, the originator of the “Pinconning Cheese” formula and producer in the Pinconning area since 1915. Marie along with her sister, Inez (Horn) Wilson of Wilson’s Cheese Shoppe, were part of a family tradition of a business alliance to produce, retail and promote the product that made Pinconning a destination for many since 1915, Pinconning Cheese! The Horn family alliance was instrumental in promoting Pinconning as it states designation “The Cheese Capital of Michigan." 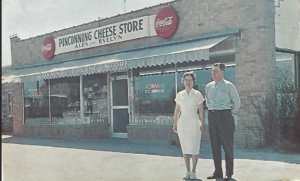 In 1953 Alex McCourt Jr. and wife Evelyn purchased the store from the Bennett’s and renamed the operation, “The Pinconning Cheese Store”. The McCourt family was no stranger to the Pinconning Cheese trade. 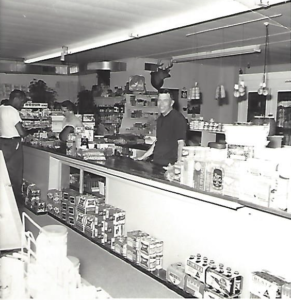 Alex McCourt Sr., Jr’s father, also operated a retail Pinconning Cheese outlet just to the south of the Pinconning Cheese Co. location, known as, McCourt’s Cheese Store which began operation in 1936. 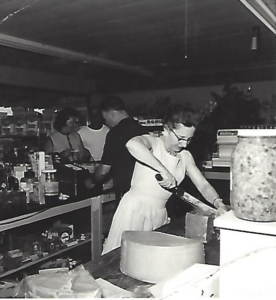 McCourt’s Cheese Store continued in operation by Alex’s brother Lyle, until the early 1980’s when McCourt Cheese Store sold its interest to Pinconning Cheese Store, in a consolidation opportunity and was completed by then owners of Pinconning Cheese, the Mastroianni family. Alex and Evelyn continued operating Pinconning Cheese until they decided to retire in 1971 and then sold their interest to Richard and Rose Mastroianni from Warren, Michigan. Along with famous Pinconning Cheese products, The Mastroianni’s expanded the business with the addition of specialties such as homemade sausages, custom takeout sandwiches, pizza’s as well as the now famous Pinconning Pizzaloaf to their daily menu. 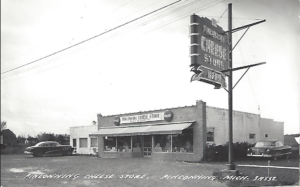 The tradition of the family-owned business of Pinconning Cheese continued to be passed along when in 1987 the Mastroianni family sold the store to Debby and Brian Saha (lifetime residents), who changed the name to the Pinconning Cheese Co. and Fudge Shoppe. Mr. & Mrs. Saha continue the family traditions that have been at the heart of the Pinconning dairy business since the early days of 1915, specializing in the famous cheese and custom-made cheese spreads, but also expanding to include homemade fudge, Michigan made meats & jerky, smoked fish, pickled items and a wide array of specialty condiments and sauces. They also established this web-based business, which can be viewed as promoting the Pinconning Cheese brand and products. Keeping to the family operation tradition, the next generation, Saha’s daughter Brooke, her husband, Ryan Kleinhans, and son Brett Saha, are part of the management team to ensure Pinconning Cheese will be well promoted in this new century. Since back when the main road through Pinconning was not much more than a two-lane dirt trail, there has always been family operated businesses developing and furthering the business and brand of Pinconning Cheese. With this deep-rooted family heritage of Pinconning Cheese, it is certain that Pinconning will continue to be known as the Cheese Capital of Michigan for the next 100 years as we celebrate the 70th Anniversary of Pinconning Cheese Co. in continuous operation! Did you know that our Pinconning Cheese is Gluten-rBGH-Antibiotic free! And the Milk is from grass-fed cows. Ingredients: Milk, Salt, Cheese cultures, Annatto, Cheese color, and Rennet. It's all natural!! !